How Are Fabric Exhibition Stands Made? Fabric Exhibition Stands are fast becoming the go-to solution for the exhibition and events industry. There are many reasons for this shift in the market, but the main reason is what they have to offer your brand. Fabric exhibition stands offer unrivalled quality and impact and set your brand apart from what is typically a sea of roller banners and pop up stands. Fabric exhibition stands are no different to any other display solution. If not manufactured correctly, they simply won’t create the impact you desire. So how are our fabric exhibition stands made? We have recently upgraded our print facility, giving us the ability to dye-sublimation print our fabric exhibition stands. What is dye-sublimation printing? Dye-sublimation is a printing process where extreme heat and pressure are used to fuse ink directly into the weave of the fabric. This two-phase printing technique sees the artwork first printed from our large format printers onto an 85gsm transfer paper using water-based sublimation ink. We profile our printers to Fogra 39 global standard to ensure a high level of detail and colour richness. The artwork is printed in reverse and the colours appear muted and dull. The second phase is where the transfer paper and TEXtsyle stretch fabric are lined up and fed into the Monti Antonio sublimation calendar. This process uses 200-degree heat to fuse the ink into the fabric. 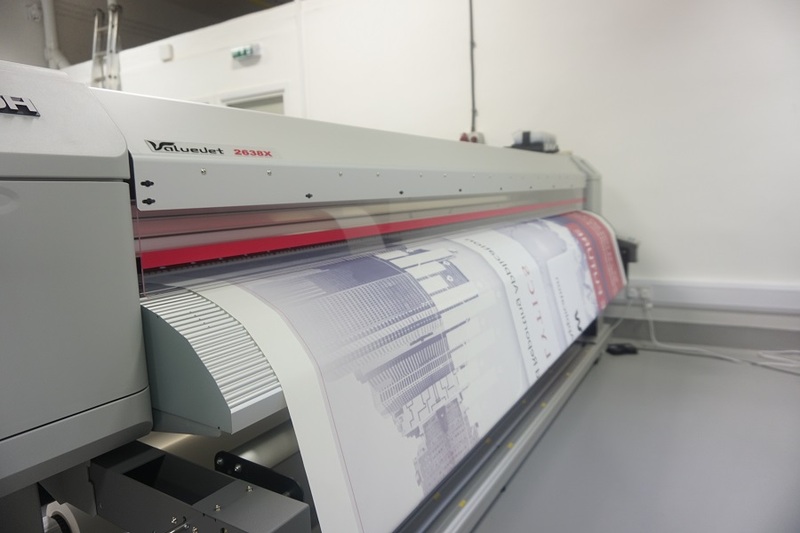 Once the fabric and transfer paper have been through the calendar, the fabric appears on the other side of the machine with the print looking bold and vivid. This process guarantees maximum vibrancy with a high-quality photo finish each time. We print and manufacture all Fabric Exhibition Stands in-house to ensure maximum quality. Once the fabric exhibition stands have been printed, they are moved over to the production bench where the print in inspected. Whilst on the workbench, the fabric is carefully hand cut around all edges of the artwork. Our fabric production team always wear special protective gloves when handling the fabric to ensure the fabric remains clean and unblemished. Once the fabric has been trimmed to size, it is then passed over to the sewing department. The two pieces of fabric are lined up perfectly and then overlocked in reverse using a polyester and cotton mix thread. The reverse overlocking gives ultra-strong seams which are invisible when stretched over the frame. The strong and durable zips are sewn in using a single lock stitch with clear monofilament thread. This clear thread adapts to the colour of the printed fabric, guaranteeing no visibility of stitching. Whilst many exhibition stand suppliers claim to manufacture fabric displays in-house, this is not the case with most of them. Cheap hardware and print imports - usually from China - mean that they are often very low quality, and by the time the product has reached you, it is too late to do anything about it. Manufacturing in-house gives us complete control over the quality of each fabric exhibition stand and the manufacturing time. At every stage of the process, the quality of the fabric, stitching and print is checked. We can design, print and manufacture within 5-6 days, allowing us to deliver high-quality solutions for a fraction of the cost. 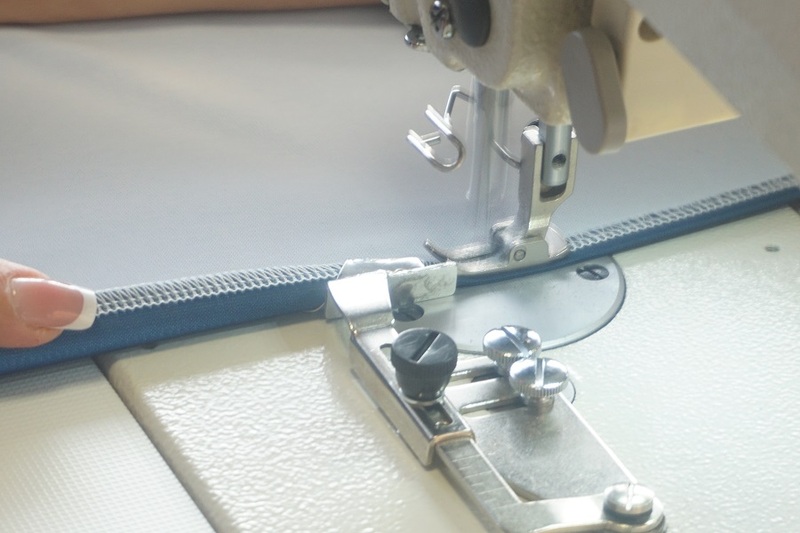 Our production team are specialists within this field so the attention to detail is second to none, and the fabric displays they manufacture are the best in the industry. With so many exhibition stand suppliers to choose from, it’s hard to know which supplier you can trust with your hard earned money. We let our customers do the talking. We are proud to say we have over 10,000 genuine customer reviews, with over 99% being 4* and 5*. We believe our customers are the best advocate for the quality of products and level of service we offer. 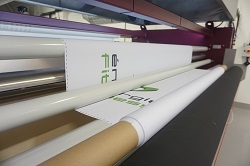 Our in-house print and production facility allows us to closely monitor our core products so that we only supply high-quality displays to our customers. This is reflected in our reviews. Our award-winning customer service ensures each customer - no matter how big or small they are - is treated with the same level of service and care throughout their journey with XL Displays. We have an extensive internal training programme so that all members of the team have the same high level of product knowledge, so they are equipped with everything they need to select the right solution for our customers. Everything we do here at XL Displays is centred around the customer experience. Why Choose a Fabric Exhibition Stand? Fabric exhibition stands provide a premium alternative to traditional PVC displays. They offer that next step in event marketing and are perfect for businesses looking to take their brand to the next level. The fabric displays offer a beautifully seamless finish with edge to edge marketing exposure. There are no unsightly joins or seams within the display that can be seen, giving you a large format area to effectively market your brand. The lightweight aluminium frame is supplied in small sections in a specially designed padded carry bag so that storage and transportation are simple and hassle-free. The carry bag features long handles so that you can choose to carry by hand or by shoulder. Our TEXstyle fabric graphics can be machine washed at 30 degrees; so they are easy to maintain and keep in pristine condition. The durable stretch fabric is hardwearing and once applied to the frame, the elasticity stretches out any creases that may be in the fabric, resulting in a crease-free display. The uniform two-way stretch polyester material is fire resistant to DIN 4102 Class B1 standard. We can supply the fire certificate, guaranteeing safe exhibiting. We have the UK’s biggest range of fabric exhibition stands and offer the most options when it comes to size and style. Our best selling is the Formulate Straight Fabric Exhibition Stand at a width of 3000mm. The formulate fabric exhibition stands are extremely easy to assemble. The lightweight aluminium frame features a simple push-fit motion, eliminating the need for multiple people or expensive stand contractors. The framework sections are numbered so it is clear which bit connects to which section. Once the frame is assembled, the one-piece fabric sock effortlessly slides over the frame and zips up at the bottom, securing it to the frame. Our dye-sublimation printing process guarantees vivid colours with a photo quality finish. The high definition artwork provides maximum brand potential and is guaranteed to get your brand noticed. For more information on our fabric exhibition stands or our graphic design service, contact us or call us on 01733 511030.